Wordful Wednesday ~ Bit by the theatre bug! 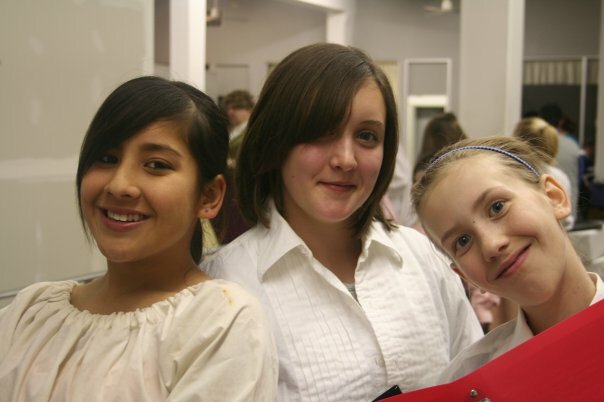 At a very young age all of my girls were introduced to our local community theatre and have starred in a number of shows over the past 7 or 8 years. It started out as a way to keep the girls busy and out of trouble because I figure that kids who are busy, have interests, and are involved in things tend to stay out of trouble more than others. I’m happy to say that it has worked…. but that’s not what this post is about. One of the very first shows that my oldest daughter was in was The King and I. To date it has to be one of the biggest and most elaborate shows that I can remember and one of the best too. Kids of all ages were involved and as a backstage parent who helped wrangle the kids, do makeup, and help keep them quiet during the show I can tell you that the amount of work involved is incredible and that the kids were simply amazing. 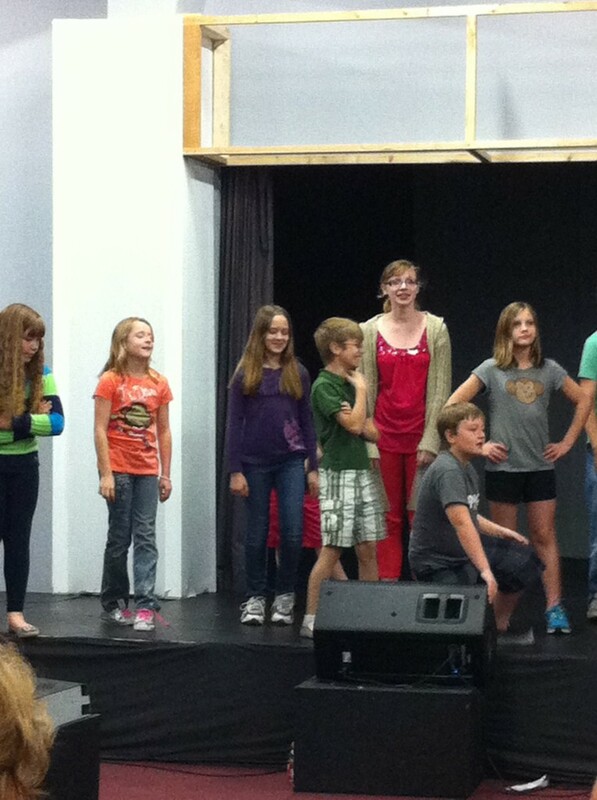 Caitlin was on of the King’s children… I think that total there was around 20 kids in this show! 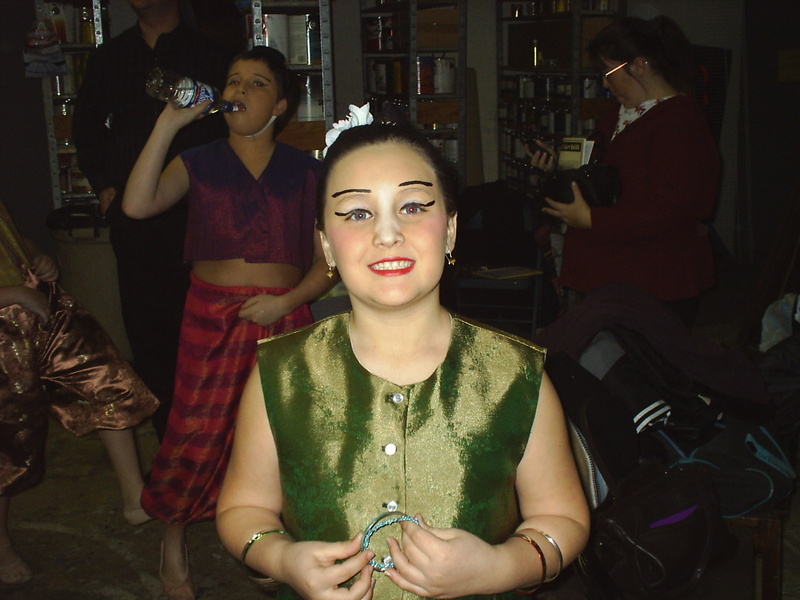 Natalie started out in the Jr. shows and starred in Mulan Jr. and Alice in Wonderland Jr. After these shows she decided she liked working backstage better even though she did a great job in both shows. 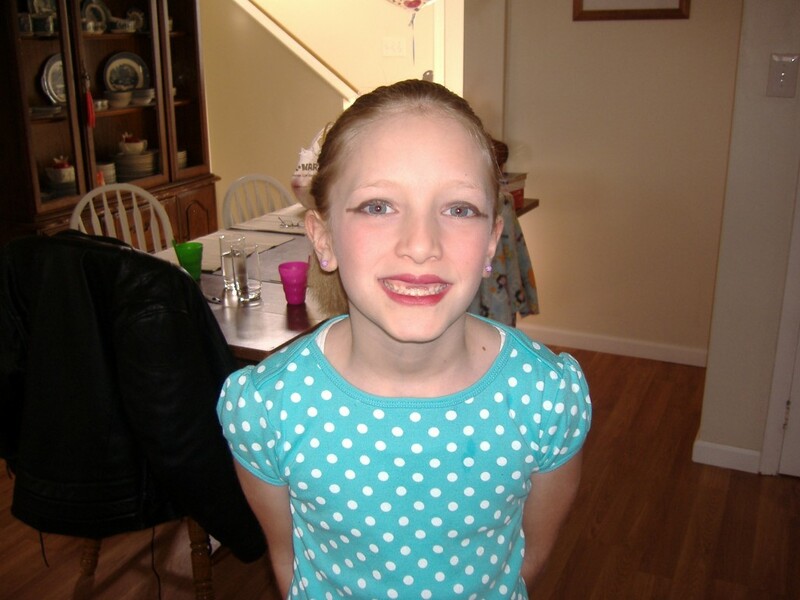 If Caitlin sees this picture she’ll probably kill me for posting it… she’ll say how terrible she looks. 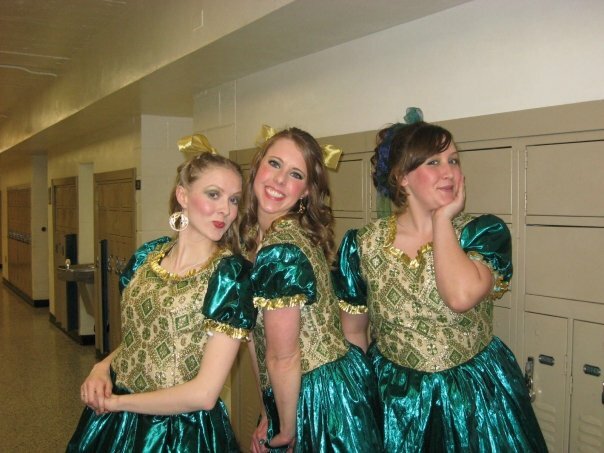 But what I see is a happy girl with her friends getting ready for the production of Cinderella. For some reason I seem to be missing pictures from so many of the girls shows! I have no idea where they all disappeared to. Right there… front and center…. 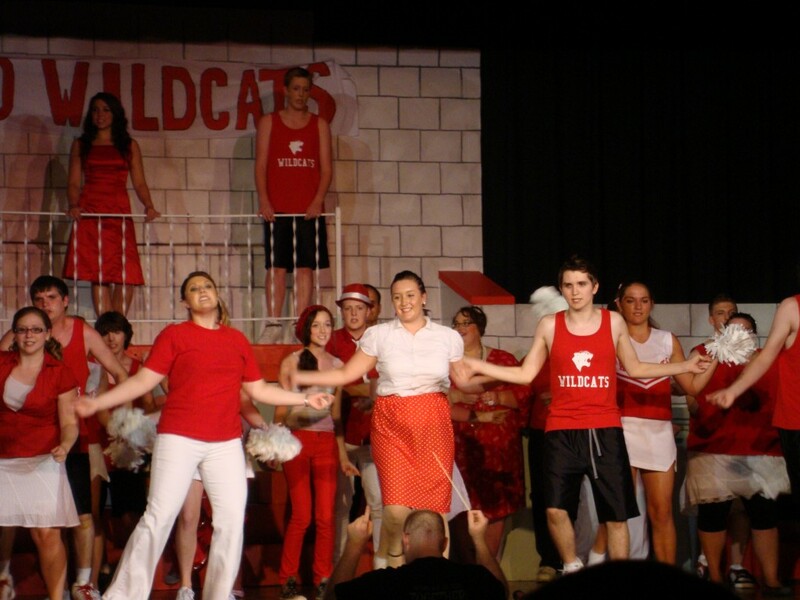 that’s my kid in High School Musical! And we can’t forget one of our favorite shows of all time! The Wizard of Oz! Caitlin was one of Dorothy’s beauticians and I worked on costuming. Let me tell ya… finding all those green outfits was a challenge! For munchkins we had mostly kids and we had to sew all of their outfits from scratch… again with tons of work! It was fun though and I’d do it again if it were a smaller show. Now my youngest daughter has been bit by the theatre bug and is starring in her very first show! School House Rock Jr. which also happens to be the exact same show that her older sister was in when she was in 3rd grade. And there she is… in the purple! I am so proud of all my girls and I love watching them on stage because they’re good. They can sing, dance, and act really well and I’m not just saying that because I’m their mom! I hope that they continue with it and always have fun up there in the spotlight. Sometimes I wonder where they get it from because I am terrified on stage, can’t sing to save my life, and well I can sort of dance but not well enough. I am an awesome audience member and backstage helper!